for financial compensation for the closure of airspace. no-fly zone revealed “no variations in… normal operational performance”. would “allow us to resume flying”. on Thursday because of volcanic ash. 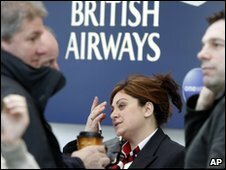 and airlines alike,” said BA chief executive Willie Walsh. any damage caused by the ash. flight would have priority and would not be bumped off for stranded passengers. to fly or not has been unfairly taken out of their hands. its rules barring government subsidies to airlines. instruments. We are indeed facing exceptional circumstances,” he said. any potential compensation is equally distributed. they benefit from lower costs than rivals,” he said. warned that the crisis would leave some carriers facing financial distress. of any compensation for businesses hit by the disruption. unclear how much money would be available and who would be able to access it. on, as well as more than £400m in available credit. and have pushed for the reopening of airspace as quickly as possible. on safety”, but admitted that a prolonged closure of airspace was “not sustainable”. there would be some flights operating from the UK on Tuesday. but was looking at its options. told the BBC that the company had written to the government asking for recompense. £5m to £6m a day. The UK carrier said it estimated its daily losses through the ban were £15m-20m. EU and national governments for financial compensation for the closure of airspace. the current situation is more considerable. closure on the air travel industry and the wider European economy. a considerable period of closure of the UK’s airspace. “their way” in a free market. They must now PAY for those decisions. charge, then that should also be paid for by the airlines who benefit! Posted: Monday, April 19th, 2010. Filed in General News.